In Part 1, I looked at how great the Philadelphia Wings were from 1987 until their 2001 Championship. And make no mistake, they were great. Then I asked how a team as successful as the Wings could possibly fold or move. To answer that, we need to realize that all of the great numbers I mentioned in that article were only for the first half (well, about 57% to be accurate) of the Wings tenure in Philadelphia. To say the rest of their tenure (2002-2014) was less successful would be quite the understatement. Instead of being 42 games over .500, they were 30 games under at 82-112. They allowed 161 more goals than they scored. In 12 seasons, they made the playoffs three times (losing all three games) and finished over .500 only once. Their last playoff win will forever remain that 2001 Championship, thirteen seasons ago. Things got so bad for the Wings that even the loyal fans started to abandon them. 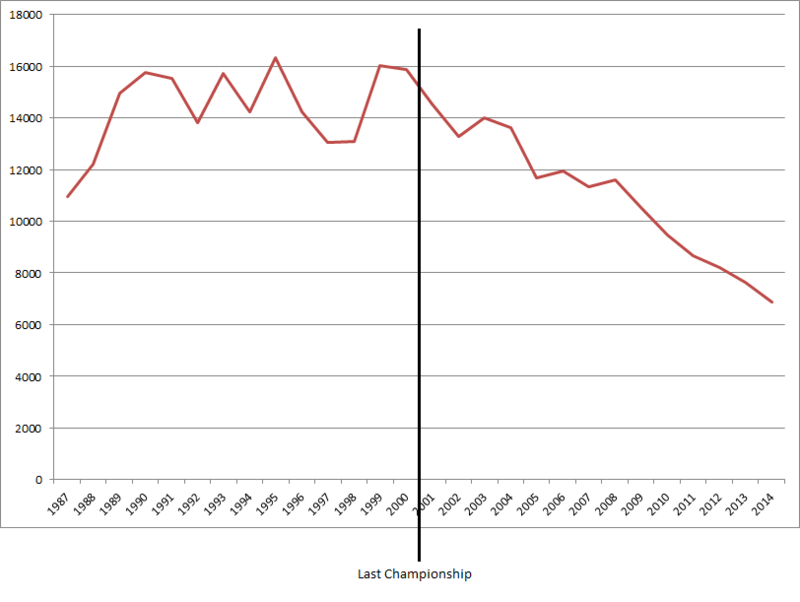 In the years following their sixth Championship, attendance dropped, rebounded again, and then dropped again. In 2005, it dropped over 14%, falling below 12,000 for the first time since their 1987 debut. 2008 saw a little rebound once again but after that it dropped between 5 and 10% every year. In the last fourteen years of the team’s existence (starting the year before their last Championship), the Wings reported year-over-year attendance increases only three times. In 2014, their final year in the league, the Wings averaged a paltry 6,864 fans per game. Only the Vancouver Stealth drew fewer. If your attendance is being compared to that of the Stealth (whether Vancouver, Washington, or San Jose), you’re in trouble. It’s not that ownership didn’t try. The Wings had more rebuilds than Joan Rivers’ face. After Marechek, Bergey, and Ratcliffe it was supposed to be Sean Greenhalgh, Athan Iannucci, and Merrick Thomson. But Greenhalgh was sent to Buffalo, concussions ended Thomson’s career early, and Nooch missed almost two entire seasons with injuries. Kyle Wailes scored 50+ points in 2009 and 2010 and never played again. The Dan Dawson experiment got them to the playoffs but no further than the first round before he was off to Rochester. Brodie Merrill has played well since coming to the Wings in 2012 but the price for landing him was steep – Iannucci, Alex Turner, Brodie McDonald, and three first round draft picks, one of which won’t happen until this coming fall. They tried having a morning game on a Friday. I’m not sure if this was a conscious decision and they were trying to draw school trips (as it was advertised) or if it was required because of arena availability. It ended up as a dismal failure, drawing the lowest crowd (5139) in Wings history. They tried putting the players’ Twitter handles on their uniforms to draw attention. It did, but not from anyone outside of the lacrosse world, or at least not for more than a few seconds. They tried rebranding themselves as “America’s team”, drafting and signing lots of American-born players. Most of these guys were field players who had played very little or no indoor lacrosse, and this strategy had varying degrees of success. Some guys like Drew Westervelt took to the game and became strong indoor players, while others like Ned Crotty never saw the same level of success indoors that they had seen outdoors. In 2014, this plan was further scuttled by a number of players including Crotty, Paul Rabil, and Brendan Mundorf bailing on the team sitting out the season to prepare for the World Field Championships. Can we find someone to blame for the failure of the Wings? Ownership? Players? Fans? Is there really so much competition for your entertainment dollar in Philadelphia that the Wings can no longer compete? Well, when you only play 3 playoff games in twelve years (and lose them all), it’s hard to convince people to continue paying money to watch your team (unless you’re the Toronto Maple Leafs, but they’re a huge anomaly in the world of sports). You obviously can’t blame the fans who kept going to games, and considering the lack of on-floor success over the last twelve years, it’s also pretty tough to blame the ones who stopped. If we must blame someone, I suppose it’ll have to be ownership, since they’re the top of the food chain and therefore ultimately responsible. But playing the blame game really doesn’t buy us anything. It doesn’t bring the Wings back, and it doesn’t make losing them any easier for fans of the league, least of all the Philly fans. The Philadelphia Wings were the cornerstone of the NLL for half of its existence. They were so good for so long and were as close to being a solid fixture in a city’s sports scene as the NLL has ever seen. It’s unfortunate that we now have to add Philadelphia to the long list of cities in which the NLL ultimately failed.